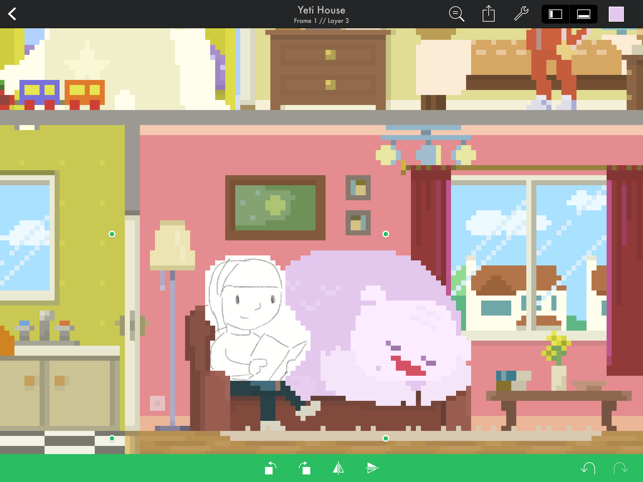 Pixaki is a powerful pixel art creation studio for iPad. It features many of the same features found in desktop apps — such as custom canvas sizes, layers, animation, precise colour selection, and customisable palettes — but with a gorgeous multi-touch interface that is just right for iPad. Whether you’re creating 8-bit game characters or vast isometric cityscapes, Pixaki has the tools you’ll need in an app you’ll love. // FOR THE FUTURE OF PIXEL ART. Pixel art is so much more than just retro. We believe that the best pixel art ever is still being made. By you. That’s why there’s nothing retro about Pixaki. The app is built to take full advantage of the latest features of iOS, and designed for a fantastic experience on iPad and iPad Pro. // PIXEL OVER YOUR SKETCHES. Pixaki’s reference layers allow you to import any image from your photo library at full resolution, resize and reposition it on the canvas, then draw pixels over the top. You can even have multiple reference layers at once, and adjust the opacity so that you can draw underneath the image if you prefer. 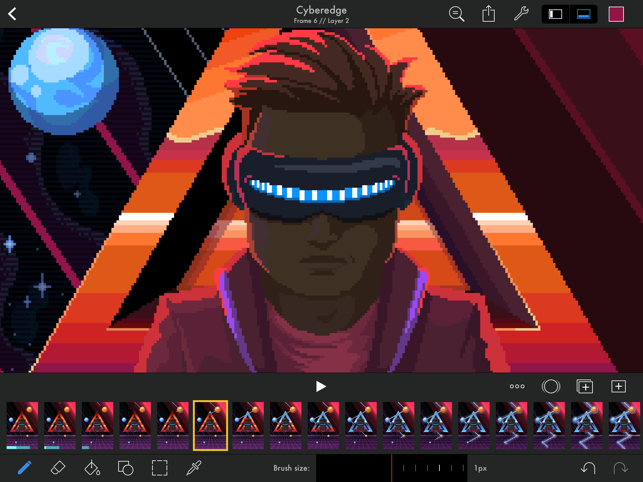 Pixel art was made to move, and with Pixaki it’s a joy to bring your creations to life. With advanced features such as per-frame duration and colour-shifted onion skinning, nothing can stop you. Supports up to 50 layers per frame. Adjust the opacity of each to easily create lighting and translucency effects. Reordering layers is as simple as drag and drop. 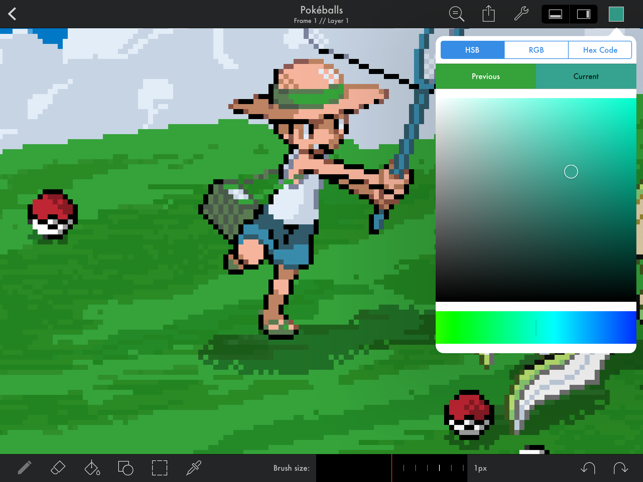 Pixaki comes with some great palettes pre-installed, but also allows you to create and save your own. Once you’ve saved a palette, you can import it into any document that you’re working on. You can also import palettes you’ve created in other software or downloaded in .aco, .pal, and .gpl formats. The line tool makes it easy to create perfectly straight lines, which can optionally be locked to angles used in isometric art. The rectangle and ellipse tools help in creating basic shapes, which can be automatically filled with colour, and the aspect ratio can be locked to create squares and circles. It might look like an old bucket, but this is actually a supercharged colour replacement tool. You can use it like a standard bucket tool, or replace all instances of a particular colour with another. This can be configured to affect just the layer you’re working on, all layers of the current frame, or all layers on all frames. Turning on erase mode to removes all pixels of a given colour. It’s a great way to work with limited colour palettes. Cut, copy, paste, move, flip, and rotate anything that you draw with a simple, intuitive interface. Touch and hold the paste icon to quickly tile an area with an image from the clipboard. Pixaki makes it easy to work with other desktop and mobile apps, as well as output for game engines and social media sharing. • Photoshop files: Import and export layered PSDs. Export an animation, and the layers for each frame are put into groups. • Animated GIFs: Import and export animated GIFs. Export supports magnification, perfect for crisp images online. • Sprite sheets: Perfect for use in your game, with a configurable number of columns. Also supports magnification. • ZIP archives: Save a PNG of each frame packaged into a ZIP file. Great for game engines and video production. 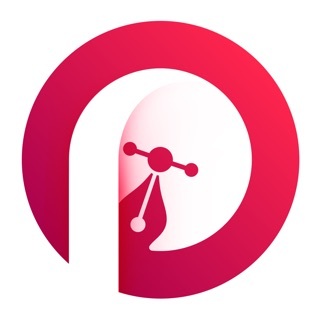 • PNGs: Export supports nearest-neighbour upscaling for crisp social media sharing. • Other images: Any image format supported by iOS can be imported into Pixaki — things like TIFFs and even JPEGs (yuck). • Palettes: Supports Adobe Photoshop’s .aco files, GIMP’s .gpl files, and the JASC .pal format. Adds support for the new iPad Pros and the double tap gesture on the new Apple Pencil. Also contains several bug fixes. I’m using pixaki on a iPad Pro with the Apple Pencil. I don’t actually use the animation capabilities, but do use pixaki extensively for all other kind of pixelart and completely moved away from using the mouse. I am very pleased with pixaki and don’t regret that I bought it. It’s a great app and the developer reacts quickly to messages (can be found on Twitter) and communication is no problem. I did encounter some bugs, reported em, got invited into beta...everything is smooth! 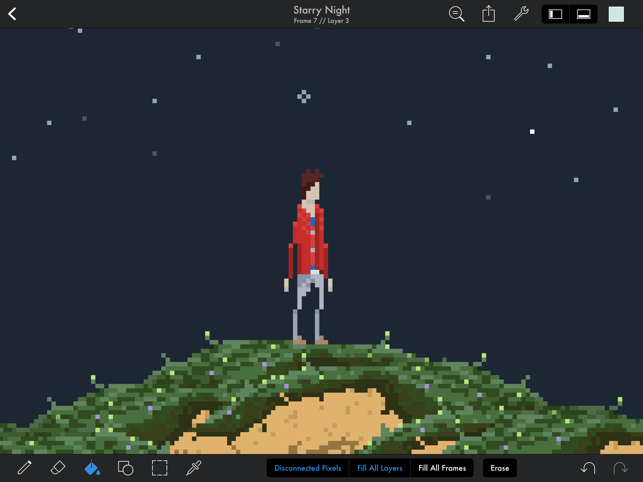 It’s a nice basic app for pixel art, but it still needs a lot of upgrades to make it actually worth this price. There are no layer options like multiply or overlay, there’s no alpha lock and there are no adjustment options to change hue and saturation for example. So if you used the wrong color, you gotta redraw everything, no other choice. I got the app because of good reviews, but I wish I had taken more time to research what this app is capable of. Procreate only cost me 6,99 and it has like 100 times more features, even if it isn’t made for pixel art. Hi, I'm sorry to hear that the app isn't living up to your expectations. There is actually a way to change existing colours using the bucket fill tool — you can set it to affect all pixels of the same colour across all layers and frames, so you can adjust colours that way. I hope that helps to alleviate some of your frustrations. 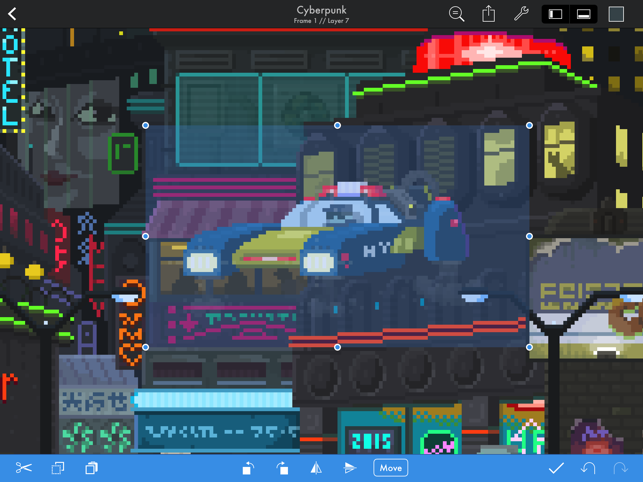 Easy to use app, that allows to make beautiful pixel art in a variety of tools. So much fun using it. Definitely the app I am most happy about spending money on! Professional working environment on an iPad. Also the developer responds quickly to suggestion emails and actually implements the features!